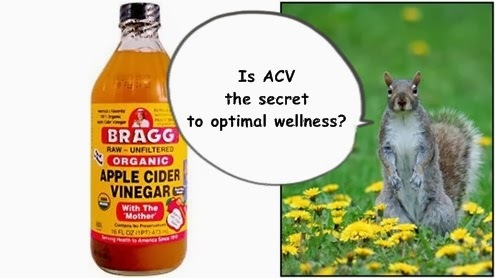 Olivia Cleans Green: Is Apple Cider Vinegar the Secret to Optimal Wellness? Is Apple Cider Vinegar the Secret to Optimal Wellness? In November, I started drinking a tablespoon of apple cider vinegar in a mug of warm water each morning. Since then, I've noticed my acne hasn't been as problematic. A few small blemishes usually pop up the week before my period, but that's it. I also haven't had any of the winter bugs that are going around. The last time I was sick was in late September when I had a cold. This is huge for me because most winters past I've battled a cold or strep throat every four to six weeks. While apple cider vinegar is lauded by natural remedy enthusiasts for it's health and beauty benefits, it's hard for me to pinpoint it as the reason I've had great skin and abundant wellness this winter. Quite few other things are different. I've crowded out sugary treats by enjoying more whole foods at mealtime and as snacks. (I still totally eat sugar. I'm just eating a lot less of it than I did in the past.) I've upgraded my natural skin care routine. I also don't take public transportation. I'm sure this reduces my coodie exposure by the millions! Do you drink apple cider vinegar? What is your experience? Do you believe apple cider vinegar is: a. the secret to optimal wellness; b. part of a bigger picture of wellness; or c. snake oil?